“Against all logic, knowing the multitude of risks to investors and to the B.C. coast and economy, Prime Minister Trudeau has chosen to double down on this dangerous pipeline and the oil tankers that come with it. “It’s outrageous that Trudeau is using public funds to bail out a multinational corporation when we could create more jobs by investing in building a clean energy economy instead. 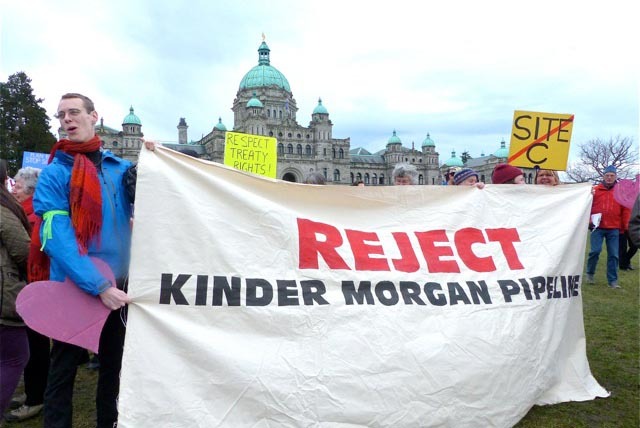 “Investors have been shunning Kinder Morgan’s pipedream and Kinder Morgan has successfully blackmailed the federal government into providing an exit strategy. “Kinder Morgan is laughing their way to the bank, and Canadian taxpayers have just been saddled with an expensive and outdated project that won’t get built. For Ottawa to pour billions into an asset that no one else wants to own is a monumental folly that flies in the face of all the evidence. “The message from Ottawa is that a tarsands pipeline and tankers are more important than endangered orca whales, the hundred thousand jobs that depend on a healthy coast and our climate commitments. “Despite the political posturing, the future of this pipeline and tankers project is not solely up to the federal government. The rights of First Nations have been recognized by the Canadian courts, the Canadian constitution and the United Nations. Multiple Indigenous legal challenges are still outstanding and can stop this project. “Now the real fight begins, and the Trudeau government is about to find out what BC made of. The Prime Minister has underestimated the degree to which British Columbians love this coast and will do what it takes to protect it. “By going into business as a pipeline owner, aiding and abetting the expansion of the tarsands, Trudeau is leaving a legacy of severe climate change impacts to our children and grandchildren, not to mention the inevitable oil spills that will wreak havoc on B.C. coast and economy. “We welcome today’s announcement of public comment on proposed provincial regulations for oil spill response. It is heartening to see the B.C. government modernizing our environment and public health regulations, and standing up for B.C.’s coast and rivers. “It’s shocking that B.C. does not have similar regulations in place already, and that big oil corporations have been allowed to operate with relative impunity. With these proposed regulations, the B.C. government is seeking to bring our province up to par with safety and preparedness measures that our neighbors in Alaska and Washington have had in place for decades. “No longer will B.C. be applying regulations from the previous century to today’s oil transport technology. The days of turning a blind eye are over. The B.C. government is standing together with B.C. residents and First Nations to protect these lands and waters, and all the jobs that would be lost in an oil spill. “However, even with new regulations in place, no approach will be able to fully clean up a major spill. Spills are inevitable and the only way to avoid an increase in spills is to avoid expanding the shipping of fossil fuels. This week we scored another victory on the path to stopping Kinder Morgan’s pipeline and tankers. On January 30, the BC government announced proposed oil spill regulations that will restrict new shipments of diluted bitumen across the province, while announcing a scientific review of the risks of diluted bitumen spills. By restricting the transport of diluted bitumen across BC waterways and coastline, the BC government has put a roadblock in the way of this already uncertain project. Kinder Morgan and the Alberta and federal governments are vowing the pipeline will still be built, but with BC’s new regulations they won’t be able to turn the taps on. This bold action is thanks to the years of hard work of people just like you – thousands standing up time and again to demand our governments take action to defend our communities, our health and our environment from the risks of oil spills. And we are indebted to the strong leadership of Indigenous communities who are in court, in the streets and on the land to oppose this pipeline and tankers. Now it’s up to us to make sure the BC government fully enacts these proposed regulations. British Columbians know that a spill into BC waterways or coastline would be catastrophic to human health and safety as well as the environment our jobs and economy depend on. 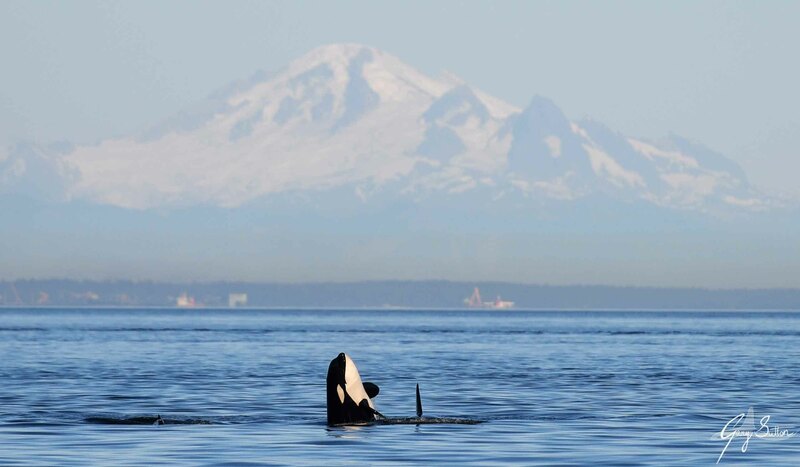 It would likely mean the extinction of endangered orca whales in the Salish Sea. The spill of diluted bitumen into the Kalamazoo River in Michigan in 2010 caused severe human health impacts and still hasn’t been cleaned up. We will not let that happen in BC. Kinder Morgan’s pipeline and tankers have no place here. The provincial government will be asking for public comment on its new regulations. Stay tuned on how you can have your say to help keep BC residents, lands and waters safe from the risk of oil spills. It will take all of us to keep the pressure on this government – thank you for all you do. Dogwood BC is organizing a bus from Victoria leaving at 6am. RSVP on Facebook and hitch a ride on the bus! Donate today to help us keep fighting for a clean coastline in BC. Feature image by Sander Jain. “We applaud the BC government for defending British Columbians from the environmental, economic, health and safety risks of oil spills. “Restricting the transport of diluted bitumen across BC’s rivers and coastline is yet another roadblock facing Kinder Morgan’s already uncertain Trans Mountain pipeline and tankers project. “Even if Kinder Morgan and the federal government keep pushing to build the Trans Mountain pipeline and tankers, with these new regulations they won’t be able to ship diluted bitumen as planned. “The spill of diluted bitumen into the Kalamazoo River in Michigan in 2010 caused severe human health impacts and still hasn’t been cleaned up. A spill into BC waterways or coastline would be catastrophic to human health and safety as well as the environment our jobs and economy depend on. “We commend the BC government for introducing regulations to defend BC residents, lands and waters from the risk of oil spills.